Not a Book Snob: Who is Annabelle? 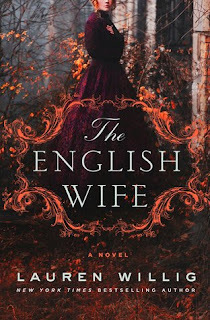 Lauren Willig's latest historical mystery, set in the Gilded Age, The English Wife, tells the story of Bayard Van Duyvil and his English wife, Annabelle. The story begins when the body of Bayard, with a jeweled dagger in his heart, is discovered at a ball given to celebrate their new mansion on the Hudson, Illyria. Bayard is a golden figure in Knickerbocker society; handsome, educated at Harvard Law School, immensely wealthy and well-connected. His bringing home an English wife from a trip abroad no doubt destroyed the plans of many hopeful mamas. Even worse, Annabelle and Bayard have retired from the New York and Newport social whirl and are seemingly content to live with their twins in a family farmhouse. The seeming contentment ends with Bayard's plan to replicate Annabelle's family home, Lacey Abbey, bringing a young architect into their orbit. Bayard's sister, Janie, discovers the body just before he dies with the name "Georgie" on his lips. Who is Georgie and where is Annabelle? Janie thinks she may have seen her floating in the freezing waters of the Hudson but can that be true? The tabloid press of the day rise in force, scenting juicy scandal and brings Janie an ally in her search for the truth, James Burke, a reporter for one of the most prominent tabloid newspapers. James himself has secrets to keep. The English Wife spans the period from 1894 England to New York in 1899. We learn that no one is who he or she appears to be and the secrets of the Van Duyvil family are poisonous. The novel puts me in mind of Daphne DuMaurier, but more My Cousin Rachel than Rebecca. I enjoy books that skip back and forth in time, revealing the truth and the characters slowly, but that may not be everyone's taste. The English Wife kept me guessing throughout; not only about the deaths but the characters themselves. After the somewhat slow beginning, I became enthralled. My understanding of both Bayard and Annabelle changed drastically several times. I highly recommend The English Wife. Thanks to St. Martin's Press and NetGalley for an advance digital copy. The opinions are my own.